Bio: With humble beginnings as rural farm-boys, The Hoppers were organized in 1957 by founding member and owner Claude Hopper along with brothers; Will, Steve, Paul, and Monroe. Over the years, the Hopper Brothers and Connie (now known as The Hoppers) welcomed and mentored many musicians and singers who have gone on to their acclaimed service in Christian music. Connie and Claude’s two sons, Dean and Michael, joined the group full-time as lead vocalist and drummer/vocalist and business leaders in the industry. While The Hoppers achieved tremendous success through the first three decades of ministry, the era of the ’90s began a new leg of their journey with the addition of Dean’s wife, Kim, as soprano. 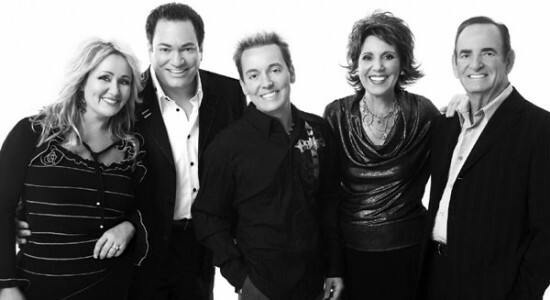 The Hoppers have traveled the world spreading the Gospel while performing favorites like “Jerusalem,” “Yes I Am,” “Shoutin’ Time,” “Yaweh,” “I’ve Come Too Far” and many others. The group has always tried to remain stalwart in their sharing of hope and God’s unmatchable love, while keeping their faith in Christ and family. Their prayer is to extend this message to all who do not know him, and encourage those who do.